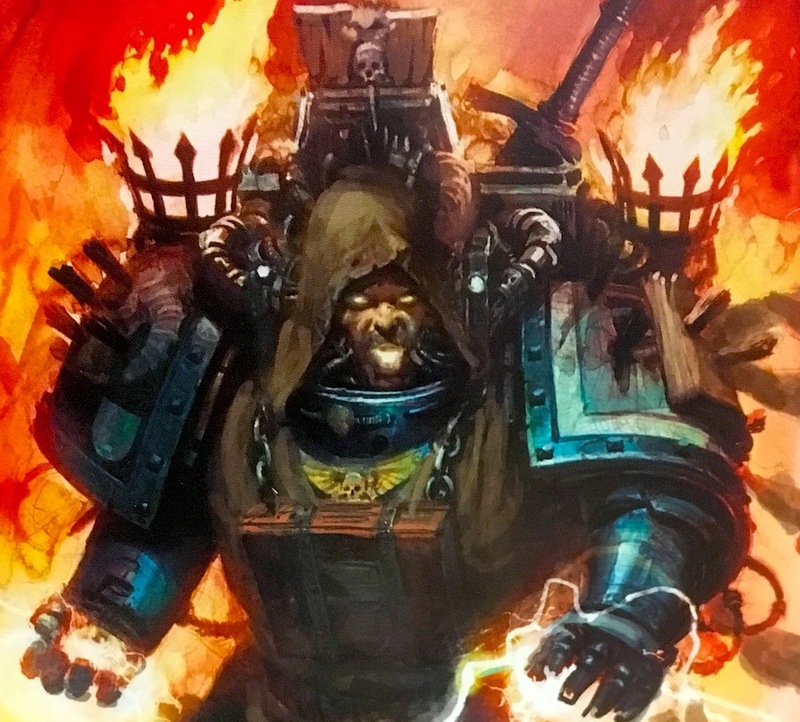 Interromancy, as the name implies, is a “new” psychic disciple developed to aid the Dark Angels in interrogation techniques. The Librarians of the chapter work closely with their Interrogator-Chaplain counter-parts to break the will of the Fallen. 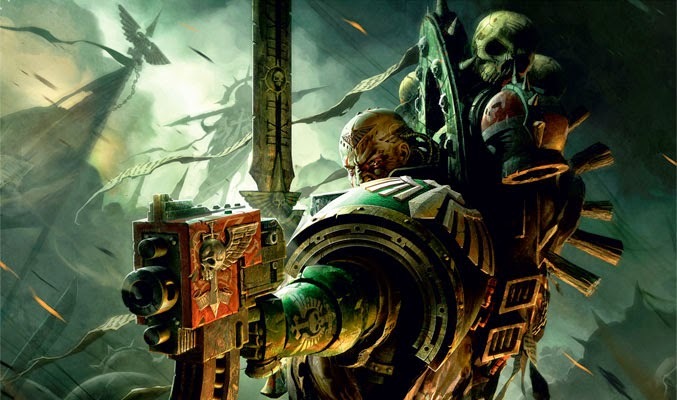 Today we’re taking a look at the Dark Angel’s preferred psychic methods and how those can help you on the tabletop. Not only does this cause a Mortal Wound to an enemy unit, but it also forces them to “fight last” in the Fight phase. It’s only a 12″ range but if you’re using this ability, you’re probably the player that is going to initiate the Close Combat to begin with. This could be pretty handy if you wanted to multi-charge a unit with a lot of your own units. Why? Because now your opponent can’t spend 2 CP to interrupt and fight with this unit (good old Counter-Offensive). It also cuts out all those pesky abilities that let units fight first, too. That is kind of a big deal especially if you’re wanting to take out an opponent’s heavy-hitter. 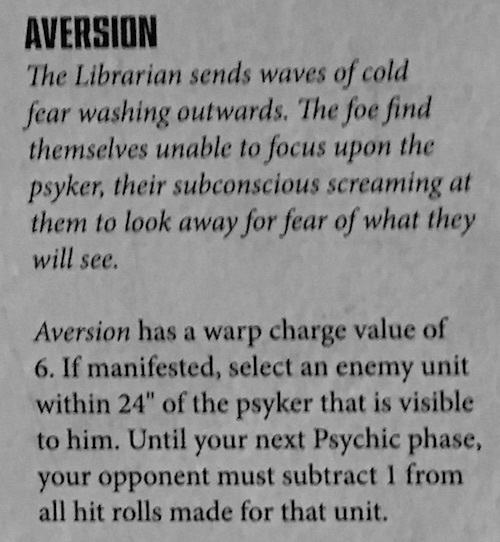 Aversion just applies a -1 to hit modifier to an enemy unit with 24″ of the psyker. That might not sound that impressive, but it can stack with other abilities in the codex that grant -1 to hit rolls. Those can add up quick. Plus, it lasts until your next Psychic Phase. It’s going to apply for their Shooting phase and their Fight phase attacks, too! Mind Wipe is going to be amazing if you can pull it off. It can really mess with a model’s abilities scores which is always trippy. 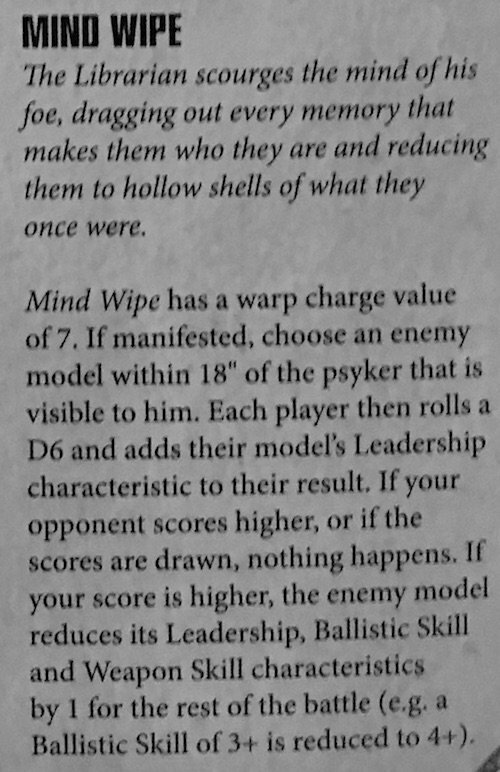 On the plus side, there is no penalty for losing the roll-off for the Psyker. Also one funny advantage of this ability is that each time you win, it becomes easier to Mind Wipe your target as they lose points to their Leadership stat. It’s the gift that keeps on giving! Engulfing Fear could be useful if you have a way to generate Morale tests for your opponent. 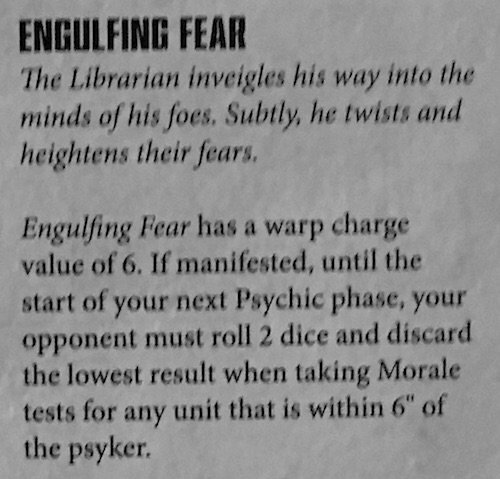 Your Psyker has to get pretty close to the action to successfully use this ability but it just might push a unit over their break point. 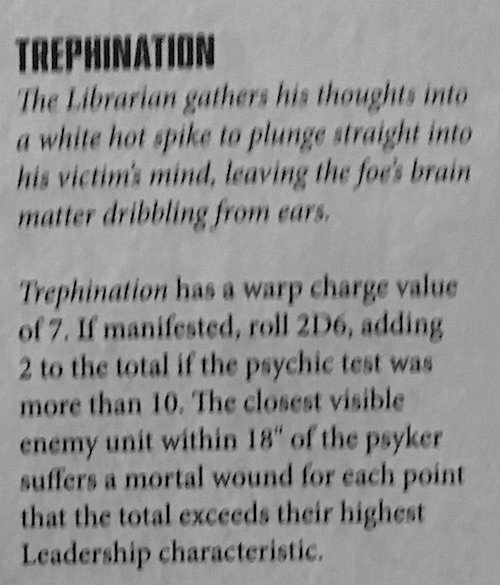 Trephination is a basically the Dark Angel’s version of their Alternate-Smite option. It can put some Mortal Wounds on a target unit (which is always nice). If you beat the target’s Leadership they suffer a Mortal Wound for each point you exceed them by. And if your original casting value was more than 10, you get to add 2 to the damage. Max damage would be 14 – their highest Leadership and each point is a Mortal Wound. Not bad! 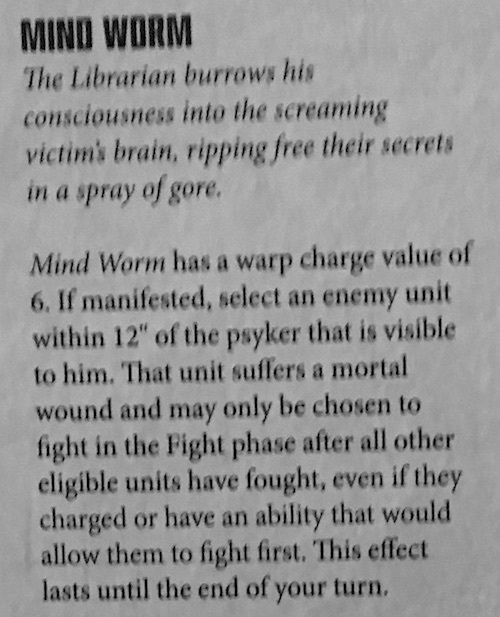 Mind Worm is a hybrid between the Damage and Debuff – hence the extra .5 for each category. It’s an interesting toolset for sure and Mind Worm and Mind Wipe can both open up some interesting options. 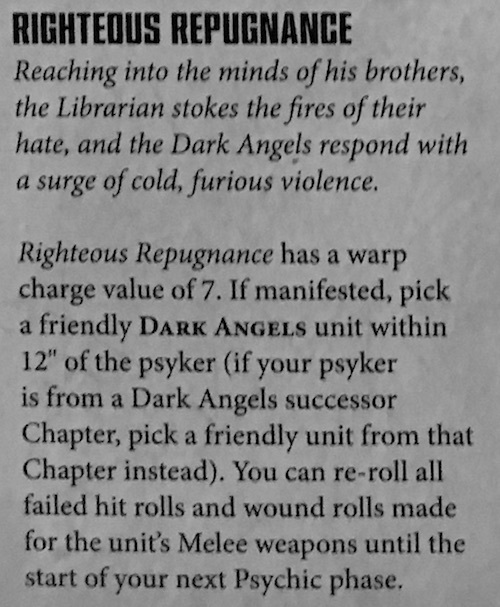 Overall, the Dark Angels aren’t going to be the Masters of the Psychic Phase, but they are going to be able to mess with your units.